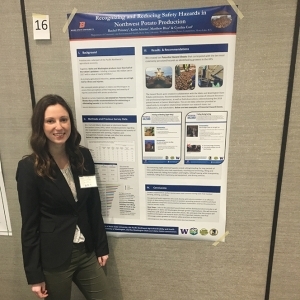 Rachel Phinney, a Department of Community and Environmental Health graduate student, has been awarded Best Poster Presentation for her poster, “Recognizing and Reducing Safety Hazards in Northwest Potato Production” at the Cascadia 2019 Annual Symposium on Environmental, Occupational and Public Health on January 10-11 in Blaine, Washington. Phinney’s poster served as a research collaboration between the Department of Community and Environmental Health at Boise State, the Washington State Potato Commission, and the Idaho Potato Commission. Additional authors of the research included: Cynthia Curl, director of the Boise State Agricultural Health Lab; Karin Adams, principal investigator for Idaho Occupational Safety & Health Consultation Program; and Matthew Blua, director of Industry Outreach for the Washington State Potato Commission. Phinney’s poster explored potato growers’ perceptions of frequency and severity of injuries associated with potato farm activities. The authors of the study developed a survey to better understand which injuries potato growers perceived as the greatest concerns. The research team found that growers expressed greatest concerns about activities that involved bending, twisting, and lifting. These types of movements can occur during multiple potato production operations, including planting, irrigation and harvesting. As a result, Phinney and co-authors created ten Potential Hazard Sheets for the top ten most commonly perceived hazards, which provided recommendations for minimizing or eliminating those hazards. To increase the awareness of these hazards, Phinney and colleagues plan to distribute the Potential Hazard Sheets electronically to all 900 growers in Idaho and Washington to improve safety practices for potato growers during production.